RBC GranFondo Silicon Valley announced today that it will be partnering with BizWorld and Positive Coaching Alliance, two nonprofit organizations that work to directly improve the lives of children and teenagers in Silicon Valley as part of its upcoming 2019 RBC GranFondo Silicon Valley cycling event. This year’s RBC GranFondo Silicon Valley commences on June 22nd, 2019 and will be a weekend-long cycling event that culminates at the Four Seasons Silicon Valley in East Palo Alto. Participants in this year’s GranFondo will have the ability to fundraise specifically for BizWorld and Positive Coaching Alliance. These charities support local youth development through encouraging an entrepreneurial spirit and promoting self-improvement through athletics. This year will build off the enormous success of last year’s inaugural event that raised $125,000 towards youth-serving organizations in the area. For more information about the event, and to register, please visit: rbcgranfondo.com. For more information, please visit rbccm.com. BizWorld is proud to partner with RBC during the RBC GranFondo Silicon Valley. We share a commitment to enriching the lives and prospects for youth in our communities and appreciate the support of RBC and the cyclists who participate in this spectacular ride. For more information, please visit Bizworld.org. PCA appreciates like-minded corporate partners who focus on impacting youth in our community. As one of the highest rated global banks, RBC recognizes the importance of helping our nation’s youth achieve their full potential, which is why PCA is proud to serve as a charity partner for the RBC GranFondo Silicon Valley. Debuting in June 2018, RBC GranFondo Silicon Valley is a weekend long high-end cycling event based at the Four Seasons Silicon Valley at East Palo Alto. Limited to 1000 riders total and focused on fundraising efforts to benefit youth in the local community, the event includes a fully-supported course with two distance categories (Medio 47mi / Gran Fondo 71mi) and returns to an outdoor food-festival at the hotel known as Celebration Plaza. An award-winning cycling events company based in Vancouver, BC, RBC GranFondo’s stable currently includes RBC GranFondo Silicon Valley (since 2018) and RBC GranFondo Whistler (since 2010), as well as the high-end boutique events Bici Gusti Gourmet Ride and the Intrepid Stage Ride Okanagan. RBC GranFondo Silicon Valley has announced the new Four Seasons Cup teams competition with a split prize purse of $3,000 to the Quattro restaurant, Four Seasons Silicon Valley at East Palo Alto. In line with UCI team regulations, teams of 5-8 riders will compete in categories of Women’s, Men’s or mixed to win an equal split of the grand prize. Results will be determined based on the total of the 5 fastest team times (based on gun time). The Four Seasons Cup will take place over the Gran Fondo course, which entails 75 mi / 120 km distance and 7000 ft / 2130 m elevation. The timed section of this will be from startline to the top of Tunitas Creek, the last major climb of the day at mile 60 to help generate even greater excitement for spectators and the competition alike. Experience the highest standards of luxury and personalized service at Four Seasons Hotel Silicon Valley, a short 30-minute drive south from San Francisco International Airport. Discover Palo Alto’s small-town charm, scenic beauty and dynamic energy converging to define one of California’s most desirable communities. Explore world-class restaurants, high-end shopping, serene nature trails and the local wine region of the Santa Cruz Mountains all within minutes of the Hotel. Open for breakfast, lunch and dinner, Quattro restaurant in Palo Alto pairs Italian inspired cuisine with world renowned wines and a charming outdoor terrace. Quattro’s contemporary setting is enhanced by natural stone and wood elements evoking the environment of the peninsula. The restaurant’s atmosphere is one of conviviality and community, supported by the personalized hospitality and the best in Italian inspired cuisine. On the outdoor terrace, guests can dine amid the natural beauty of the Palo Alto surroundings, complemented by the relaxing sound of the water wall. The team that creates RBC GranFondo Silicon Valley and Whistler, based in Vancouver, has managed Gran Fondos all over Canada and also creates cycling events throughout the year including all-inclusive, high-end rides: Bici Gusti Gourmet Ride and the Intrepid Stage Ride Okanagan. Their experience in creating bucket-list bike rides will make their first-foray in California an event for your 2018 calendar. Following the same route as the Gran Fondo until the town of La Honda, the PrestoFondo detours right towards San Gregorio, where the Gran Fondo course is again met. Riders then return to East Palo Alto’s finish line and celebration zone on the same route. PrestoFondo riders can choose to participate as an Alta Classe rider: the event’s deluxe upgrade package. 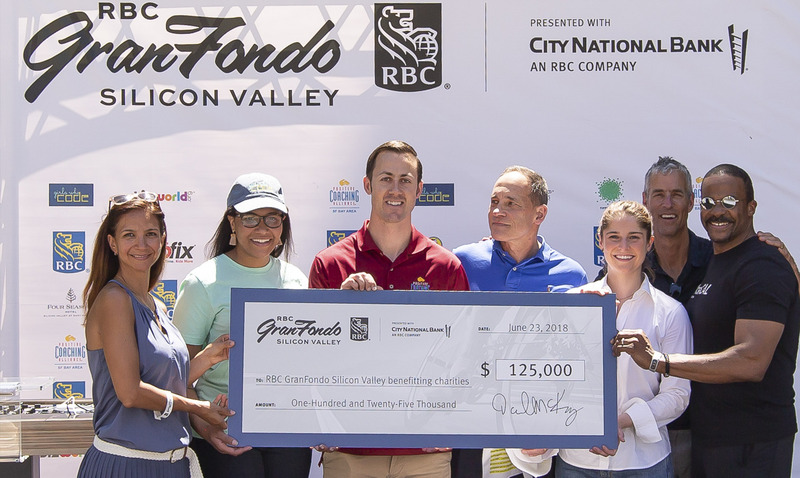 Principal sponsor Royal Bank of Canada (US) and RBC GranFondo Silicon Valley have announced the event’s partnership with of four youth-serving non-profit organisations that work to directly improve the lives of children and teenagers in Silicon Valley. Taking place on June 23rd, 2018, participants will have the ability to create landing pages and fund-raise money for the causes of their choice. The four organisations are: Bizworld, Girls Who Code, Positive Coaching Alliance and Tipping Point Community. Neil McKinnon, founder of RBC Silicon Valley said, “RBC and City National Bank are committed to making meaningful and positive contributions to the communities where we live and work. In an effort to support our future generation of leaders, we invest in youth-serving organizations that provide kids with the support and tools necessary for them to achieve their full potential. BizWorld is committed to enriching the quality of education and future prospects for under-served youth, promoting financial literacy, and assisting all children in achieving their highest potential. We are the largest teacher-led entrepreneurial program in the world, having reached nearly 700,000 children in the US and globally. We believe we can inspire every child to have an entrepreneurial spirit: to lead confidently, think critically and creatively, and be financially responsible. BizWorld is proud to partner with RBC at this exciting inaugural event. We share a commitment to enriching the lives and prospects for youth in our communities and appreciate the support of RBC and the cyclists who participate in this spectacular ride. Girls Who Code is a national nonprofit working to close the gender gap in technology. Through its Clubs, Campus, and Summer Immersion Program, Girls Who Code is leading the movement to inspire, educate, and equip young women with the computing skills to pursue 21st-century opportunities. By the end of 2018, Girls Who Code will have reached over 50,000 girls across the U.S., enabling each one to be a part of a sisterhood that promotes their passion to use technology to solve problems and make a positive impact on the world. This summer Royal Bank of Canada (RBC) will host its inaugural Summer Immersion Program in Jersey City where twenty girls will have a unique opportunity to learn to code at RBC offices. Girls Who Code is thrilled to be a beneficiary of the RBC GranFondo Silicon Valley, and to celebrate RBC’s support in building out the talent pipeline of female computer scientists. Tipping Point Community works to break the cycle of poverty by identifying the most promising non-profits and improving public systems and policies. Since 2005, Tipping Point has invested in the most effective front-line interventions in education, employment, housing and early childhood development. In the past year alone, Tipping Point helped put 23,000 people on a path out of poverty. Since Tipping Point’s board covers all costs, 100% of every dollar donated goes where it’s needed most. Expanding the Tipping Point community means growing impact and partnering with the RBC GranFondo is a great opportunity to share Tipping Point’s mission and engage more people in the fight against poverty. The team that creates RBC GranFondo Silicon Valley and Whistler, based in Vancouver, has managed Gran Fondos all over Canada and also creates cycling events throughout the year including all-inclusive, high-end rides: Bici Gusti Gourmet Ride and the Intrepid Stage Ride Okanagan. Their experience in creating bucket-list bike rides will make their first-stab in California an event for your 2018 calendar. RBC GranFondo Silicon Valley to be an official USA Cycling sanctioned event. The official governing body for all disciplines of competitive cycling in the United States, USA Cycling, has confirmed that it will be fully sanctioning the RBC GranFondo Silicon Valley cycling event on June 23rd, 2018. RBC GranFondo Silicon Valley is set to be California’s newest Gran Fondo, including a stunning course and weekend of celebrations that will provide a further boost for the region’s already cultured cycling pedigree. In becoming a sanctioned event, the ride will follow standardized rules, as well as enjoying support for the athletes who participate. Founding riders in 2018 will experience riding through some of the best roads North California has to offer. Making the most of the hills overlooking both Silicon Valley and the Pacific Ocean, the scenery is matched only by the challenge with the course taking in 75 mi / 120km of distance and 7,050 ft / 2150m of elevation. A number of fully stocked aid stations will be available for the riders along the course to replenish their energy to fully enjoy the route ahead. RBC GranFondos are known for their finish line festivities. It’s all about the experience of going for a big ride with your friends and celebrating post-ride. The Silicon Valley event will be no exception with the route starting and ending at Four Seasons East Palo Alto. The team that creates RBC GranFondo Whistler, based in Vancouver, has managed Gran Fondos all over Canada and also creates cycling events throughout the year including all-inclusive, high-end rides: Bici Gusti Gourmet Ride and the Intrepid Stage Ride Okanagan. Their experience in creating bucket-list bike rides will make their move to California an event not to be missed for your 2018 calendar. Recognized by the United States Olympic Committee and the Union Cycliste Internationale, USA Cycling is the official governing body for all disciplines of competitive cycling in the United States, including BMX, cyclocross, mountain bike, road and track. As a membership-based organization, USA Cycling comprises 60,000+ annual members; 2,500+ clubs and teams; and 34 local associations. The national governing body sanctions over 3,000 competitive and non-competitive events throughout the U.S. each year and is responsible for the identification, development, and support of American cyclists. The creators of the largest Gran Fondo in North America are expanding to a new location in 2018: Silicon Valley. In the heart of northern California, known for high-tech and venture capitalism, it will become a hub of cycling with this new event on Saturday June 23, 2018. The first year will be limited to 1000 cyclists and registration opens September 15, 2017 at 10am PT. Inaugural riders will experience a challenging 75 mile course that goes through the heart of Silicon Valley, climbs into the majestic red woods, descending to the rugged coast-line before heading back. This ride will challenge even the hardiest rider. The team that creates RBC GranFondo Whistler, based in Vancouver, has managed Gran Fondos all over Canada and also creates cycling events throughout the year including all-inclusive, high-end rides: Bici Gusti Gourmet Ride and the Intrepid Stage Ride Okanagan. Their experience in creating bucket-list bike rides will make their first-stab in California an event for your 2018 calendar.